Brigade Road’s quirky spot for drinks, drama, and sports screenings goes by the name Laughing Llama. With interesting bar bites and live music, it’s got the makings of a go-to neighbourhood bar. Sure, everyone’s go-to spot for drinks and merrymaking on Brigade Road is the “historic” Chin-Lung. But with Laughing Llama comes yellow paint, plenty of llama-related decor pieces including coasters and posters, and a cheery vibe. The place works for us with bar booths, corner spots, and community tables providing plenty of seating options come game nights or when you need to let out some steam after a long day at work with your friends or colleagues. Yes, date night with a side of drinks work too especially in the outdoor seating area. Plus, the contemporary playlist downs all the din from the road. Gigs and sports screenings are big here with more live music sessions in the coming months is what we hear. Llama’s drinks menu range from fun cocktails such as Drunk’s The Gola, Cafe Coffee Drunk and Iced Tea Reloaded. The gola is the bartender’s take on the street food favourite with vodka and khala khatta syrup. The iced tea comes with kokum syrup and the trifecta of gin, vodka, and rum, and should see to it that you have a fun evening. If you are sneaking in a quick drink during work hours order yourself a Daiquiri or craft beer from White Owl and Simba. The classic cocktails include G&T, Mojito, and Pina Colada. Need bar nibbles? Enter Koli Gappas, Ghee Roast Goes French (fries), and Spice Spice Baby (Andhra chilli chicken), your stars for any time of the day. The gappas are basically pani puri shots, except the stuffing is butter chicken and the shot is a rich creamy makhani gravy. 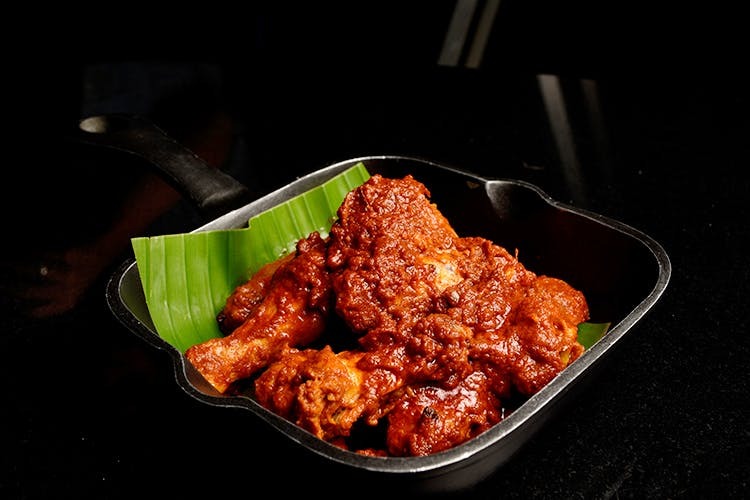 The ghee roast fries is sort of a divine revelation, and we love the Ghee Roast Wings too. Ample portions win here and while we didn’t venture into the pasta and pizza section, we loved the filling Done With Donne Chicken Biryani (chicken tikka biryani). We must add that we are going back for some of that Once Bitten, Twice Marinated, a chef’s special beef steak with pepper sauce, and their all-day brekkie. Table booking comes highly recommended on weekends!